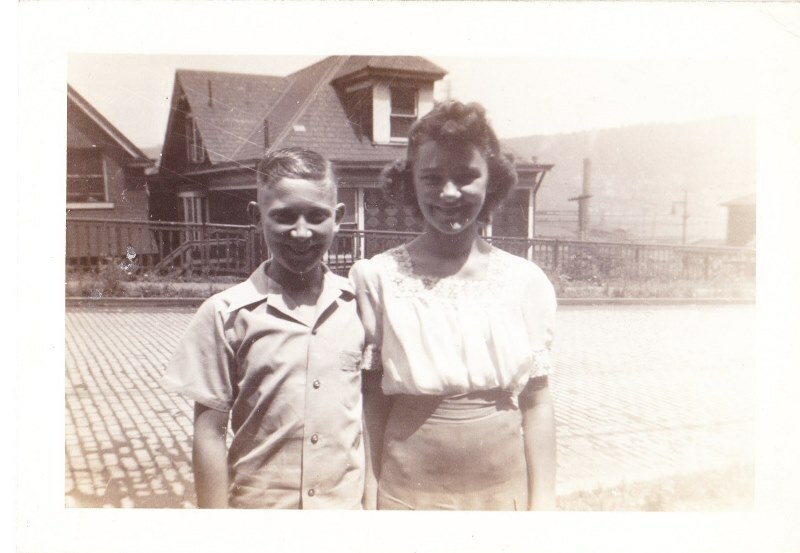 My dad, John “Salty” Salopek and his sister Sylvia at 220 North First Street, Duquesne in the mid 1940’s. Photo courtesy of John A. Salopek. I called my dad and asked him, “Hey, what do you know about Nick L..…?” “Nick Lee Hollow? We played there all the time!” he blurted out before I could complete my sentence. It was obvious that these words brought back a flood of memories, because Dad spoke with great enthusiasm, and I couldn’t write fast enough to keep up with him. Dad’s family lived at 220 North First Street in Duquesne during the mid-forties, the War years. He would have been in his pre to early teens at that time. at the top of First, Second, and Third Streets. But, if we wanted to play football or baseball, we played in the hollow which was made of slag.” He threw out a few family names – Castro, Cantino, and Jelicic – guys he used to play football with. Technically Nick Lee Hollow includes the entire area extending from Polish Hill — to the train tracks under the Thompson Run Bridge — all the way to the river. To get to the hollow, Dad said they climbed down stairs that existed somewhere around the north end of Fifth Street and played in the large vacant space all the way down to the bridge at Duquesne Boulevard. He recollected that Ziegler Lumber Company was on the far side of the bridge by the river. Thompson Run Bridge in Duquesne circa 1926, facing Duquesne Place. Photo donated to the Mifflin Township Historical Society by Dom Toretti . In 1999 Jim Hartman, president of the Mifflin Township Historical Society, reproduced a booklet originally published for the Duquesne Silver Jubilee in 1916. According to this publication, the hollow was previously part of farmland that changed hands several times, and by 1841 became the property of Dr. George Oliver. Consequently, the area became known as Oliver Hollow for many decades. I am not sure how the name Nick Lee Hollow came into being, but Hartman identified Nick Lee as an African American who lived in the hollow and who was employed as the “night soiler” (garbage man), for the city of Duquesne. Lee wasn’t the only former resident of the hollow. Prior to the summer of 1928, Oliver Hollow was home to many families. According to a Commentary written in 1993, housing in the hollow was constructed by the steel company to accommodate mill workers. Some of the resident families were identified on this photo contributed to the Mifflin Township Historical Society by Dom Toretti of Dom’s T.V. Also in the background of the photo you can see the Thompson Run Bridge extending over the train tracks and the Duquesne Merchant Mills in the distance. My dad commented during our conversation that he thought the houses down in the hollow were just a continuation of the streets in Duquesne. Tidbits of information were coming my way, and I became curious, so I made some comparisons. Homes in Oliver Hollow facing east toward the river. Photo donated to the Mifflin Township Historical Society by Dom Toretti . Homes in Oliver Hollow facing east toward the river. Street Names labeled in yellow. Star identifies the home of Peter Petrocsko, Jr. at 222 Raspberry Street. Photo donated to Mifflin Township Historical Society by Dom Toretti . This is the same pre-flood neighborhood shown above, facing west rather than east. Holiday memories made by families who lived in Oliver Hollow were swept away by a horrific flood that fateful evening. According to the July 6, 1928 issue of the Duquesne Times (page 7), 125 families from the area of Oliver Hollow were rescued from desolation and accommodated by other residents of the city. The cause of the flood was more than torrential rains mingled with the water of Thompson Run. Usually water drained from the hollow via a 4-foot culvert, but the pipe became clogged with debris from the storm, so the water could not escape. Headline from the July 6, 1928 Duquesne Times, page 7. Newspaper courtesy of the Mifflin Township Historical Society. One death resulted as Peter Petrocsko, Sr., age 45, died attempting to assist in the rescue effort of his son, Peter Petrocsko, Jr., and the neighboring families of Mike Brinsko, John Scaronki, Mike Petrosik, George Cipkala, and Mike Septicula. According to the Times, Patrocsko, Sr.’s “body was found near the door (of his son’s residence) which he had apparently opened to get out and was knocked down by the onrushing waters.” I have marked this address with a star in the above photograph with the yellow labels. Photo showing the aftermath of the July 4, 1928 flood. Subsequently Oliver Hollow was abandoned after the July 4th damage. The clearing provided the steel company with more capacity to dispose of wastes, eventually filling the void with additional slag. Although not officially part of the city’s playground program, this dumping ground gradually transformed into Nick Lee Hollow, a recreational area for my father and other young people of Duquesne. Through the passage of time, lively voices of children in the hollow have drifted away, and new generations are unfamiliar with the past. Before the deluge of the decades destroys all evidence of their stories, let us remember this place as a memorial to Mr. Petrocsko, Nick Lee … and our dads. Thanks for your comment, Joe. I’m glad the article brought back wonderful memories for you. I never even knew about this place until I someone asked me about it. I haven’t heard about any mines, but I will ask around. You never know where one question might lead! Thanks, again. According to the PA mine subsidence web site a lot of Duquesne and Duquesne Place have abandoned coal mines under it. 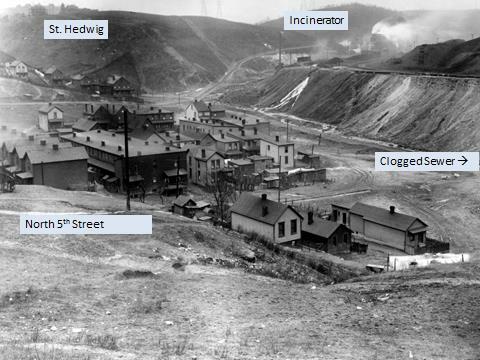 I believe that a panoramic photo from 1938 taken from across the mon shows a coal tipple beyond Thompson Run bridge in Duquesne place or West Mifflin. Mark Fallon has posted copies of the photo to one of the Duquesne face book groups. Really amazing photo. 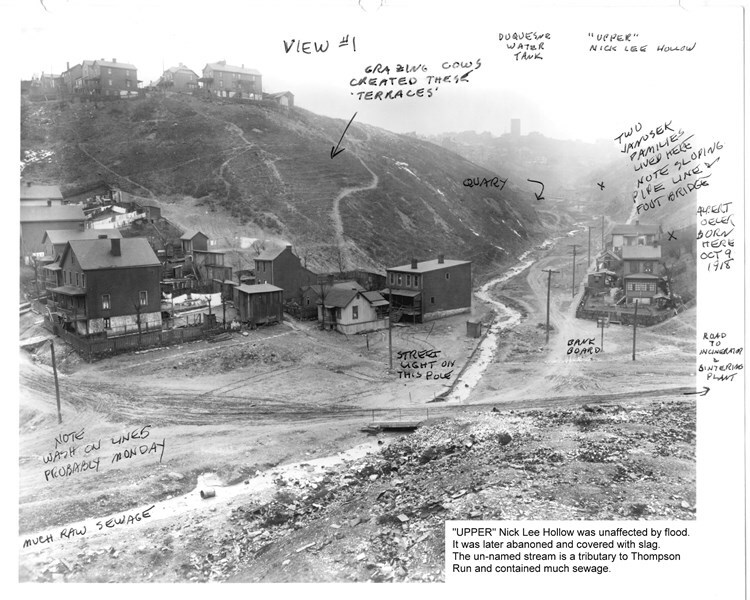 documents the neighborhood below first street that was taken over by the mill expansion in 1940. Above current Cochrandale there used to be a bridge that carried fifth street over the hollow. 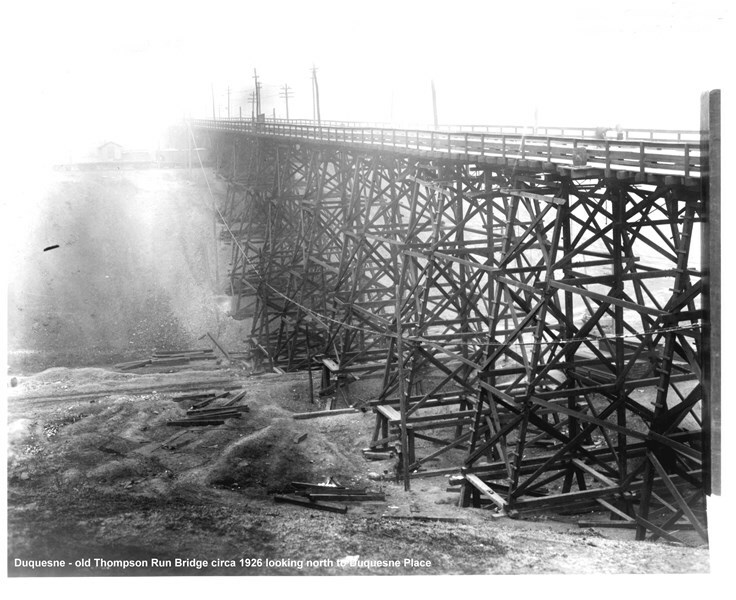 The bridge was abandoned and the upper part of the hollow was filled in with slag from the mill. Wow, Harold! Thanks for answering the question about the mines and for the additional information. I will have to search for that photo online now! I really appreciate your comments. Reading the names involved brought back a flood of memories. My Grandma Kilen used to talk about the cows grazing on the hillsides; unfortunately since I was brash and young I never believed her. The evidence of cows grazing on the hillside was one of the first things I noticed about that photo! Isn’t that amazing? It was such and industrial location, but then it wasn’t. How times have changed! Thanks for your comment. Great article; learned some things about Nick Lee Hollow that I never knew. I learned how to play baseball and football on that field. Had no idea about the flood of the 4th of July. Sorry I didn’t reply to your comment sooner! I think I “liked” a similar comment you posted on FB, so in my mind I responded. I am glad you liked the article. Since starting this project, I have found that every little historical gem I uncover leads me to a golden key that unlocks yet another treasure chest of discovery! I have a couple more Duquesne stories in the pipeline that are just waiting for some documentation. I am truly amazed at the amount of things I didn’t know! Thanks for your comment! Quite Amazing and THANK YOU ! I had been totally curious and interested in the mysterious “Nickley Hollow” . . . and as I discovered over the last few months that it was (or is) Nick Lee Hollow , I wondered why nobody I knew (including myself) ever questioned how “it” was spelled , and just assumed that it was “Nickley Hollow”. I had been away visiting my son in California , and after getting things back in order at home , I finally had some time to spend on the computer and happened to get on your site tonight , and . . . WOW ! The mystery of Nick Lee Hollow was starting to unfold before my eyes. I had bought a book called Duquesne by Daniel J. Burns and it did have some information and photographs concerning Nick Lee Hollow. I also received some information from my brother-in-law (Lori’s husband) . 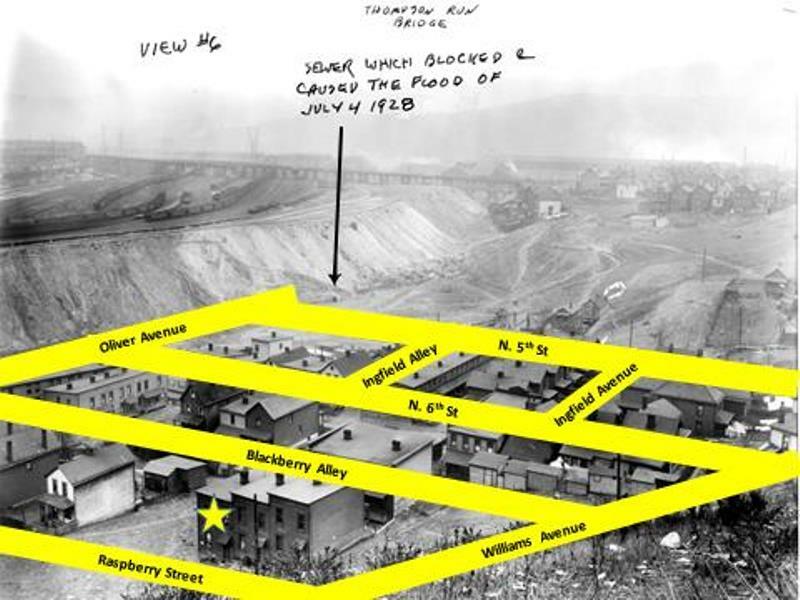 . . he had said that his Grandfather told him many years ago that Nick Lee was a member of the first African American family who lived in Duquesne and was a “honey dipper” (sewage / septic worker) . . . I obviously could not verify any of this , but the information that you gathered claiming that he was a garbage collector has similarities to the information that I was informed about concerning Nick Lee. Absolutely Amazing . . . you have done an EXCELLENT job of gathering some great information about , in my opinion , one of the most intriguing and mysterious missing pieces in the puzzle of Duquesne’s past ! THANKS AGAIN ! ! ! This is so very interesting . . . my brother-in-law Ray also told me that he had discussed Nick Lee Hollow with Jim Hartman (who Lori worked with in the Post Office). I did notice one thing of interest . . . in the newspaper article concerning the flood they referred to it as Oliver Hollow (1928) . . . I wonder if it became Nick Lee Hollow after the flood ? ? ? Just food for thought . . . Thanks again for researching and gathering this information. Nick Lee probably never would have dreamed his life would be researched and be a point of interest almost 100 years into the future ! By the way , you mentioned the Ziegler Lumber Company . . . in my house I have a wooden fireplace mantle that my sister Lori gave me taken out of the house she now lives in on Polish Hill (Edgewood Ave.) and printed on the back of it is “Ziegler Lumber Company May 12 , 1902” – pretty cool ! Hi Patti , another point of interest . . . Reading your information about Nick Lee and who he was living with made me think that I had heard that Clagget name somewhere in the Duquesne book written by Daniel J. Burns . Nick Lee’s widow sister Sadie Clagget has the same last name as an African American artist / painter , I assume from Duquesne , named Levi Clagget . . . I located this information on page 44 of the Duquesne (Images Of America) book . . . there is an example of one of his paintings and a caption underneath it. Levi Clagget had very large hands and he depicted this physical trait on the people in his paintings. Apparently he painted many beautiful works of art pertaining to life at that time. Drew! It is not nice to tempt someone who is addicted to genealogy. LOL I have that book, and I left it at my parents’ house. I did find a small part of it on Google Books, including a painting by Levi Clagget. According to that book, Levi Clagget was the first African American to be born in Duquesne and also the first to graduate Carnegie Mellon University. I did some more research on him and found several documents online. To summarize: He was the son of James J. and Lucretia B. Clagget who owned a home at 501 Williams Street in Duquesne in the 1910, 1920, and 1940 census records. Levi B. Clagget was married to a Caucasian woman named Rida Treon in 1916 in Philadelpha who passed away leaving him a widower. He married again in 1937 in Prince William, Virginia to Frances Addison. Documents identify him as a scenic artist, illustrator, and designer. Wow! I want to know more! Where can I find some samples of his work????? That Burns book says that his portrait of first settler, Benjamin Tate is in the counsel chambers of city hall. This is getting way too interesting! Great history made in Duquesne. Someone should use this information to motivate the youth living in the city today. DOUBLE WOW ! Patti , You are so observant ! I didn’t even notice that information about or that painting by Levi Clagget in the Duquesne book . . . so amazing ! I did find some information on line concerning his second marriage in Virginia but I have not been able to find any of his paintings . . . yet. I have been searching through some African American painter / artist sites , but none of them has mentioned him. And I agree with you ,Levi Claggett could be an inspirational icon to the youth of the city of Duquesne today . . . Once again , THANKS for the great work ! I Put my last name Petrocsko in bing search, and this Article was part of the search. I am shocked to see where My Great Grandfather Peter Petrocsko Sr. Died Saving my Grandfather Peter Petrocsko Jr.. I always Heard about the flood and never really knew where it was. I am totally floored to see where they lived. My Dad has 1 photo hanging on the wall that was saved from the flood of my Great Grandfather and Grandfather and Grandmother. If it was not for Peter Petrocsko Sr Saving Peter Petrocsko Jr. I would not be typing this Letter now !!! Thankyou Patti for the Rare find of photo’s and History!!!! Thank all of you for the clarification. I grew up in the area and never knew why it was named “Nickley Hollow”. Like Dr. Ken said, I knew it as a place where the boys played baseball and had no clue of why it was called that. I never knew any of this either until readers inquired about it. I found it a fascinating research topic! Thanks for reading and commenting, Patricia! Great look into some old memories of Duquesne Nick Lee Hollow. Thanks to all for the information. Pattie I grew up with Salty, your dad. Knew Silvia very well also. Thanks so much for the info and pictures. My dad lived in Nick Lee Hollow, and was 5 yrs old at the time of the flood. His name was William Cipkala. Michael Cipkala was my grandfather. 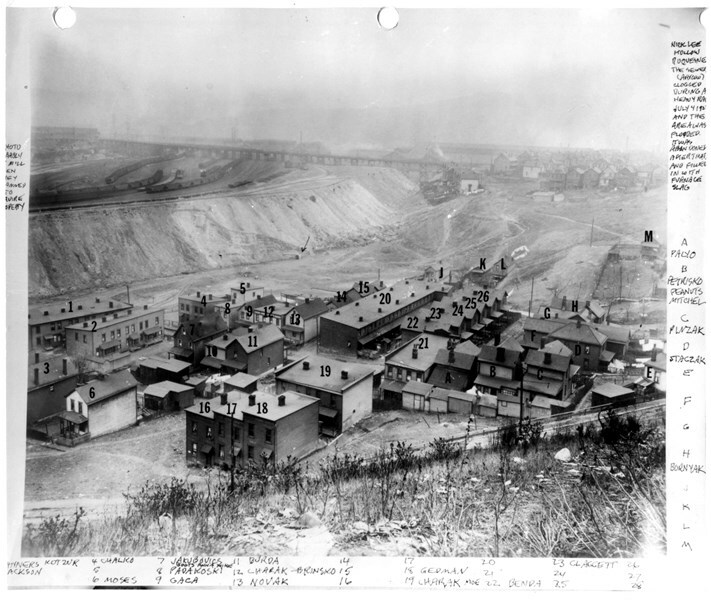 Dad grew up in Duquesne; went to school there; worked in the mill. I’d heard dad mention the name Patrocsko over the years, and the fact that there was one person who had perished in that flood. I love these details about Duquesne; my brother and I often reminisce about the years that we lived there. The memories are bitter-sweet. And I’m sure that anyone who lived there when it was a thriving town, knows exactly what I mean. I often wish I could relive the experience, pay closer attention, ask more questions, appreciate everything more. I cant ask Dad. Sadly, he passed away 3 years ago. PS: I always thought it was Nickley Hollow, too. Nice to see you on here again Pat. Patricia I lived on 2nd St near Oliver School. I knew you’d Dad very well. We all played in The Nick Lee Hollow,growing up. The basketball hoop on 3 rd Street near Oliver Av, had (Nick Lee Hollow Rams) on the banking board. My Aunt and Uncle Chalfant lived on 1st st near your Dads Family. Also knew Bill Cipkala from the 60s. My grandmother was Katherine Cipkala Yarosik Cherpak, your granddad’s sister. She was living in Nick Lee Hollow at the time of the flood and lost everything. I have been doing genealogy and would like to share info w/you. My paternal grandparents lived in “the Hollow” at the time of the flood and lost everything. My grandmother was Katherine Cipkala Yarosik Cherpak. I believe Michael was her brother. She married 2 fellows from her village of Torysky, Slovakia. The first, my grandfather George Yarosik, died in the 1922 Flu Pandemic. She married John Cherpak, a widower, whose wife died in the same pandemic. My husband and I traveled to Slovakia with the C-RS of Homestead (Carpathian Rusyn Society) a few years ago and met a niece of Katherine’s living there. Please contact me if you’d like to talk more about our family. You can reach me, Marlene Yarosik Prosnik, at 703 569 6420 or my email mgprosnik@aol.com. I hope you see this! Hi James! I just now noticed that I never replied to your earlier post back in May — don’t know how I missed that — so sorry. Thank you so much for commenting! It is exciting to connect with someone who knew my family, grew up with my dad, and who has valuable memories to share. Thanks for enriching us with more information to add to our vision of what Duquesne must have been like. I love to sit back and envision what it was like back then. My dad passed away this summer … I already miss the conversations we used to have about his life. Please continue to share your insights — love hearing from you! Hi Patricia, Thanks for your reply. I’m so sorry to hear that your father passed away. He was a great guy, and I’m sure you miss him. I think I remember seeing your school picture with my son Jim. I don’t remember what year, but at the time, I wondered if you were related to Salty. Small world. Best Wishes and a Merry Christmas. As a child I lived on N. Fourth just up from Hamilton Ave. right across the street from the Capristos. I would play with Bruce Capristo and played in the hollow almost every day. I remember watching the soft ball games and remember the Zemps. On hot, dry days the ball field was just powdery dust up to two inches deep. So much history I never knew. Thanks so much. Thanks so much for adding your first hand account. It means a lot to me to read the memories of people who actually experienced the things I write about. Thank you! I stated 1958 but I meant 1955. That’s when I joined the AF. When I returned in 1958 my parents had moved to Karl St. way up the hill off Kennedy Ave. Thanks Jim. My dad often spoke of all the fun times at the end of 2nd. He really was fond of those memories! The painting of Duquesnes first settlers was done by the black artist, Claggett. It can be seen at Duquesne City Hall. Look closely at Tate. He is depicted as African American. I walked to Nik Lee Hollow around 1955, to see a shack where a man lived. The shack was covered with license plates. The man whose name escapes me, used to stand at the corner of 1st and Grant, bumming cigarette butts from drivers stopped at the redlight. Does anyone remember his name? He was to Duquesne what Old Overcoats was to McKeesport. Thank you so much for sharing your memories! If you don’t mind, I will share them with a few other people I know and see if they have any memories to share also! I think his name may have been gonas my dad told me he was a shell shocked WW1 vet. Thanks so much for sharing this information and preserving memories! When I was a child my father took me to a place overlooking the Mon and Yough Rivers. It was a natural cave about 6 feet deep, formed by the same geological processes as Indian mailboxes. It had names carved on the inside wall going back to the early 1800s. The Carnegie muesem did an archeological survey around 1936. My dad called it Indian cave. It was destroyed when river road was widened. Does anyone remember it?